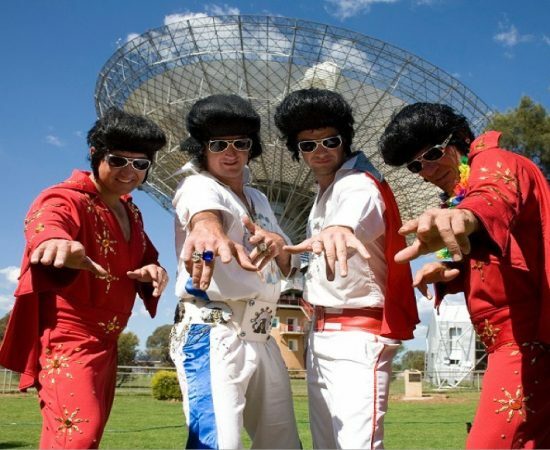 Since 1993, Parkes has been the home of the fabulous and fun Parkes Elvis Festival. Every year, the event has grown bigger and better, attracting fans from all of Australia and overseas. Timed to coincide with the great man’s birthday on January 8th, the festival is 5 packed days of parades, dress-up fun and, of course, music. Each year the program grows and now there are approximately 120 individual events over the five days. The program includes the headline Feature Concerts Series, the Elvis Gospel Service, the North Parkes Mines Street Parade, non-stop free entertainment in Cooke Park, the popular Renewal of Vows, the Goodsell Machinery Miss Priscilla Dinner, Poets’ Breakfast, busking, dancing, cake decorating and much more! The Elvis Express between Sydney to Parkes is an annual highlight for Festival visitors. The Festival experience begins even before visitors arrive in town, as they are serenaded by Elvis all the way from Sydney. In 2015 more than 20,000 visitors attended this major event. The Festival now enjoys a worldwide media audience of 60 million with fans around the globe. And while you’re here, you must visit the Kings Castle Elvis exhibit also in Parkes. This is home to the largest collection of items formerly owned by Elvis Presley in the Southern Hemisphere. Greg Page’s famous collection includes jewelry, movie, stage and personal clothing, books, documents and furniture owned by Elvis or directly connected to his life. What an incredible fun time you’re going to have! And of course, the best place to stay in Parkes over this festive time is the lovely North Parkes Motel. We are conveniently situated within walking distance of all the activities and will provide a welcome retreat from the action. Hurry though, during Parkes Elvis Festival time, accommodation fills up fast so book early to avoid disappointment and call 02 6863 4333 today.